My friend and I had some business to take care of at Surulere. Immediately we finished, we decided to stroll down to Shoprite to get some food. Before I share my experience, I want to apologize for the picture quality. I didn’t go with my camera so the pictures were taken with a Blackberry Bold 5. Let’s go on. I was seriously craving Blue Bunny ice-cream, and you know they say everything at Shoprite is ridiculously cheap, yeah? So I decided to buy it there instead of at YEM-YEM in school. How wrong I was! 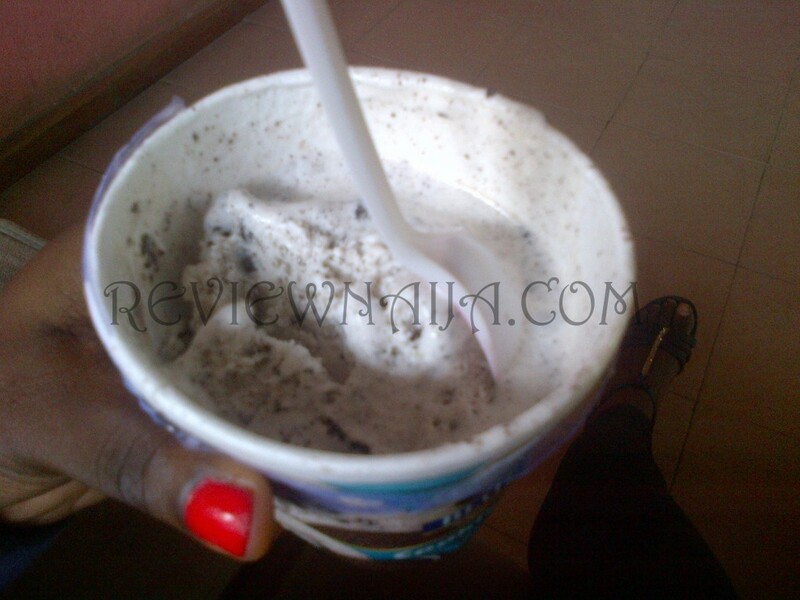 In Shoprite, Blue Bunny one pint ice-cream goes for 1,489 naira, while it cost 1,350 at Yem Yem. 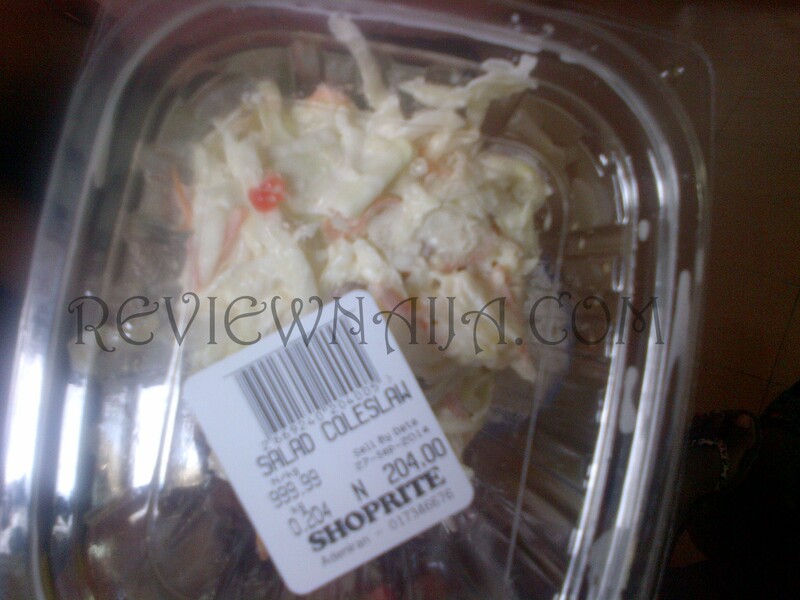 As I write this review, I’m trying so hard not to think about the 139 naira I “dashed” Shoprite. YES! I am Ijebu like that! My plan initially was to just get ice cream and leave, then I remembered that I had to eat dinner to take my pills. Sadly, Sandra the diva has been ill and needs proper attention and care lol. So, I headed over to the food section of Shoprite. Here, they sell food per Kg. I was ready to order my regular spaghetti and chicken and caesar salad, but my friend encouraged me to try something new and that was how I did o. Sigh. Let me explain how this works – When buying food here, you have to be alert! They’d just be heaping food for you, and you’re paying per Kg. On the counter you might see 121 naira per Kg and you will think, Oh the food is so cheap, let me get more. By the time they weigh it, it’s more than a thousand naira on just rice or spaghetti alone. So always be vigilant! I followed my friend’s advice and got the Paella seafood rice. I carefully watched the attendant dish out my food, and on the second heap, I literally screamed, It’s enough please! She just looked at me like “what the heck” and went to weigh my food. 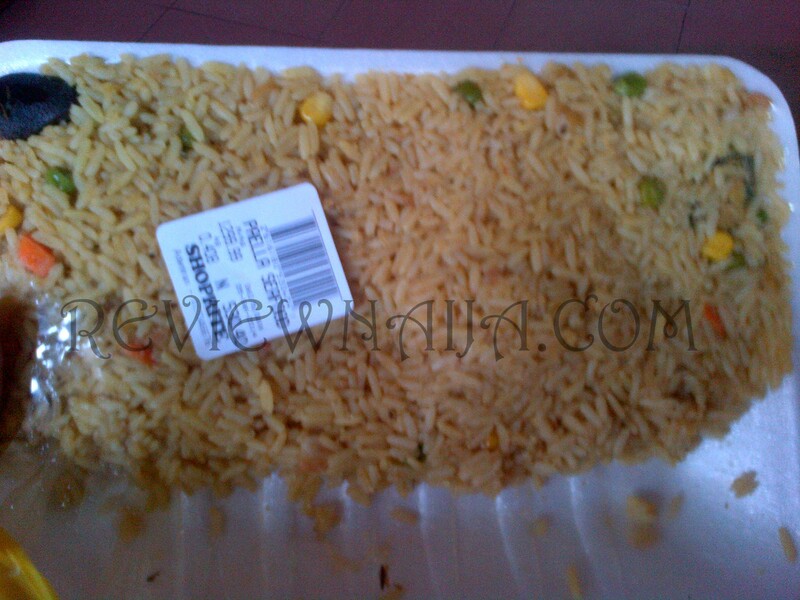 Upon the scream, the seafood rice was 530 naira…something that was 114 naira per Kg. I moved to the salad section, and got coleslaw. The vigilant rule also applies here. I indicated when I felt it was enough, and it came out to be 204 naira. Great buy in my opinion! Then the last section, the chicken section. You will see chicken goes for 140 naira per kg, and one will think maybe one piece of chicken goes for 140 lool. Of course not, They weigh the chicken as well. So, when you are picking, open your eyes well. 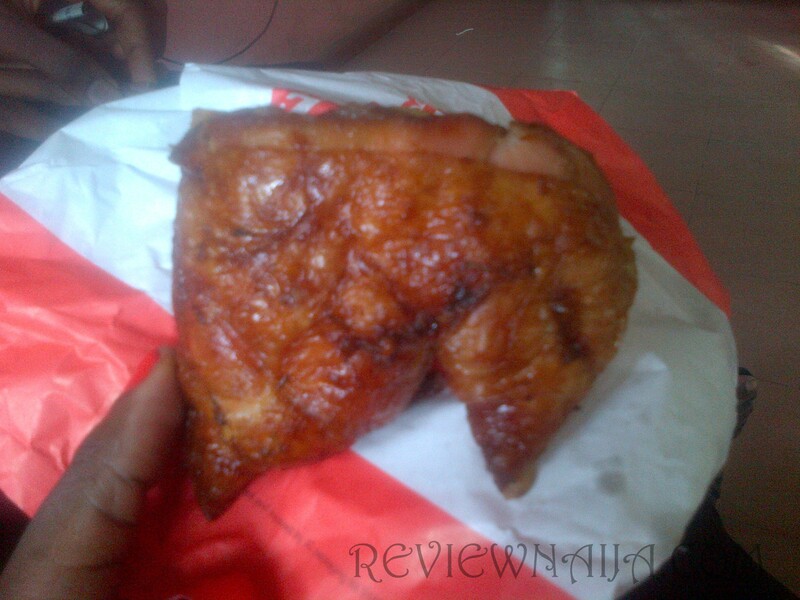 I picked one reasonably sized chicken, and it cost 362 naira. The guy that sold the chicken was so friendly compared to all the other attendants. He had this “I know you’re a student, hence the need to save money” look Lol. We headed over to the counter to pay, and I was literally praying the POS wouldn’t dissapoint since I have joined the “Cashless Nigeria” wagon. The fine cashier confirmed it was working, and I paid my bill of 2587 naira. TIME TO EAT!!! I was too excited to try my Paella rice and to be honest, it was a total disappointment. It didn’t meet up to the hype at all! It was even cold and I totally hate cold food. I was angry that “oloju kokoro” made me ditch my spaghetti for “special rice”. It had all the works; snail, prawns, name it, but maybe I expected too much. Maybe it’s just me sha but please try this rice and tell me what you think about it using the comment box. Thanks! The salad was just too good! I even regretted getting too little. It had mixed fruits in it, and I’m a sucker for mixed fruits!. The salad is a 10 over 10 for me! The chicken was properly grilled but the seasoning was pathetic. I felt I was eating very dry chicken, no pepper, no nothing. I love my spices, I’m Mexican like that #Famzing 😉 Did I mention that I got the vanilla and cookie flavor Blue Bunny ice cream? See ehn, that’s like one of the easiest ways to my heart. That’s our little secret 😉 . Shoprite! Shoprite!! 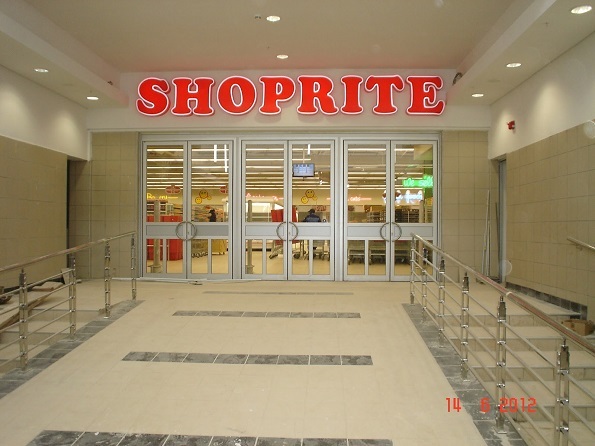 Shoprite!!! I liked you better when you were the cheapest store. What’s up with all the increased prices? I still want to be a loyal customer. Just kidding. But I think I’d just stick to regular items I get from here. The frozen food. Richmond, walls sausages etc is frequently rotten. I shall DEFINITLY be shopping elsewhere for my processed meats. Even the fresh chicken and other meats, particularly the Ground products, are suspect. I’ve fallen in love with shoprite’s sandwich and potato and egg salad. It is amazing ..
@siege, lool. Please don’t get the rice.. Go for normal stuff. cream ehh? *packs bag(plus atm card), taking a trip to shoprite and then to ya heart* lol. Anyways, nice review. Had no idea they sell cooked meals @ shoprite but if ever I find myself hungry n in SR, I’ll be sure to steer clear of d “panache” thingy meal dat u had. Abi aint that how its spelt?